It is reported that the question of allotment of 4G Spectrum has been referred to TRAI by the DOT and the same is pending with the TRAI for some time. The allotment of 4G Spectrum to private telcos was never referred to TRAI. Then why refer it to the TRAI when it comes to BSNL. This is completely discriminatory and against the interests of the subscribers and BSNL. Further the anti-BSNL stand of the TRAI is well known through its past decisions. The government should put an end to this injustice to the BSNL. The 4 G Spectrum should be allotted BSNL with out delay. Com.K.G.Jayaraj General Secretary met Shri.S.K.Jain, DDG (Estt), Department of Telecom on 20-08-2018 and discussed the issue of immediate pension revision from 01-01-2017 with 15% fitment recommended by the 3rd PRC and approved by the government, delinking the wage revision in BSNL. The DDG stated that on our demand of pension revision without waiting for wage revision, necessary approval was sought from Department of Pension & Pensioners Welfare. However DOP& PW has replied seeking certain clarifications which will be dealt with in due course. Wage Revision, Pension Revision etc. AUAB calls for Hunger Strike on 24, 15, 26 July 2018. 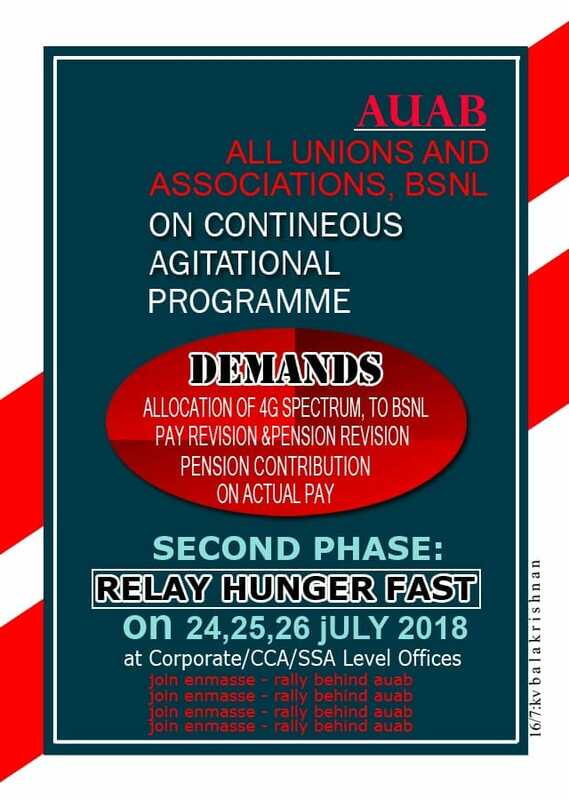 AUAB has called for 3 days Relay Hunger Strike in front of Offices on the demands of Wage revision, Pension Revision, Allocation of 4 G Spectrum to BSNL etc. AIBDPA, the Association of Pensioners in BSNL, has extended full solidarity and called upon its members to participate in full strength in the programme. Wage Negotiation for wage revision for BSNL Non-Executives will start on 20th July 2018. After much protest and persuasion, the BSNL Management has restored the Medical Allowance without voucher for out-door treatment. But the management has reduced the quantum. This is not acceptable. The Management should restore the Medical Allowance for pensioners as earlier. Otherwise it will be treated as an insult and against senior citizens as provided in the Maintenance and Welfare of Parents and Senior Citizens Act 2007. AIBDPA General Secretary has already taken up the case with the CMD BSNL.